Successfully Added Nissan Consult ECU Diagnostic Interface to your Shopping Cart. The Nissan Consult ECU Diagnostic Interface lets you use your computer to diagnose engine problems and even fix them yourself! 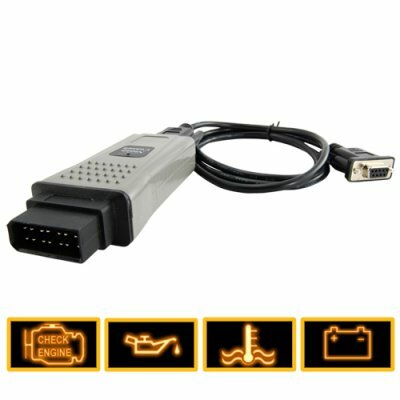 This diagnostic cable and a laptop computer are all you need to begin diagnosing and repairing your Nissan car right away. This cable supports real-time engine sensor monitoring and logging, active engine tests and work support, engine self learn control, and ECCS log file replay. You can also display the status of the input and output signals at the engine control unit (ECU), read the conclusions of the error log, and display the name of failed circuits. Once you have located the source of a problem, you can begin troubleshooting it immediately. Your local mechanic charges an arm, a leg, and a piece of your fender for each and every one of these tests, so this cable will effectively pay for itself with the money you save on visits to the mechanic. Using this cable and any compatible software you download from the internet is easy. There is no need to physically replace chips, connect extra wires, or adjust hardware. Just connect one end of the cable to your computer's RS232 port and the other end to your Nissan's 14-pin Consult port, which is normally located near the fuse box. You can now use the your favorite software (such as ConZult, ScanTechNissan, Z-Control, SRTalk, or other compatible software) to access your Nissan's data. It's that easy! Professional and amateur mechanics as well as anyone concerned with the performance of their Nissan will love this product. Take advantage of our unbeatable low price to try one out today. Order in bulk to enjoy even greater savings and stock up for your store or for beating the competition on eBay! From your best source of high-tech, low price gadgets, Chinavasion. Compatible Cars: All Nissan cars that have the grey 14-pin Consult connector (located near the fuse box). These cars are usually from the year 1989 to 2000, including models such as 300ZX, Z32, Maxima, 240SX, S13, S14, Skyline, SR20DE, SR20DET, RB20, Altima, and Fairlady. Does this cable work with my car? This diagnostic code scanner works on all Nissan cars that have the grey 14-pin Consult connector (located near the fuse box). These cars are usually from the year 1989 to 2000, including models such as 300ZX, Z32, Maxima, 240SX, S13, S14, Skyline, SR20DE, SR20DET, RB20, Altima, and Fairlady. What software can I use with this cable? You can probably use the freeware or commercial version of ConZult found on the internet. Other software options might include DDLreader v.15c, DDLreader v.16c, ScanTechNissan, Z-Control, SRTalk v.1.0, ZCSetup v.2.0, ZTalk v.1.1, Nissan Data Scan v.1.4, Nissan Data Scan v.1.51, however, but we have not tested it with any particular brand of software and can not guarantee performance or compatibility with any particular software package. Most functions require only the ignition to be turned on, not the engine. Works with SR20Di Nissan engine.